In 2009, there were 10,000 reported incidents of airplanes and birds colliding, the most famous of which resulted in the landing of a passenger jet in the Hudson River. Bird strikes, as they are called, are increasing because the skies are getting more crowded with airplanes. The birds most often involved in these collisions are large birds with large populations, like geese and gulls. Waterfowl (31%), gulls (25%), raptors (18%), and pigeons/doves (7%) represented 81% of the reported bird strikes causing damage to USA civil aircraft, 1990-2008. (Over 780 civil aircraft collisions with deer and 280 collisions with coyotes were reported.) (Data from www.birdstrike.org) . And bird strikes are increasing at a rate of 2% per year. If you think about where many airports are located – LAX, SFO, Newark, JFK, Miami, Salt Lake City, they are near water or marshes where there is not much human development and where birds congregate. The Sacramento International Airport has had more bird strikes (over 1300 in the last 20 years) than any other airport in the west and the sixth most in the country. Reason: it is located in the Pacific Flyway, a major migration path. But it’s no reason to stop traveling by air. There have been fewer than 250 human fatalities due to bird strikes since official data began to be collected in 1912. The first reported bird strike was by Orville Wright in 1905 who chased a flock of birds with his plane and killed one with a wing. The first recorded bird strike fatality was reported in 1912 when aero-pioneer Cal Rodgers collided with a gull which became jammed in his aircraft control cables and he crashed. 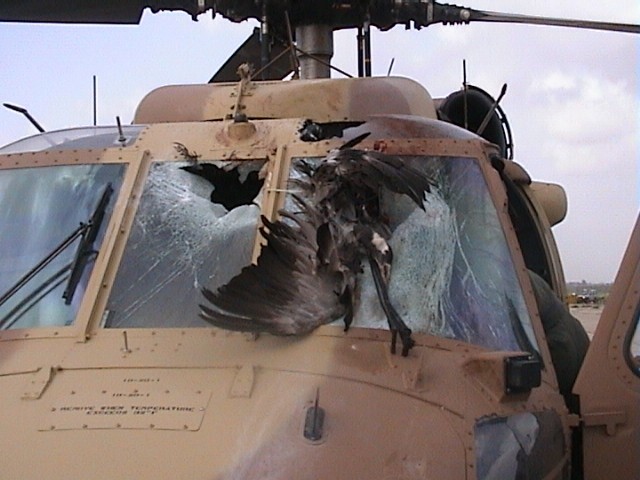 The bird-plane collisions that result in serious damage are due to the bird hitting the airplane windshield or being sucked into the engine. Most collisions do not have serious outcomes, luckily. In September last year at the Tulsa, OK airport an American Eagle plane hit a flock of 100 pigeons on takeoff and returned to the airport uneventfully, where the parts of 34 pigeons were removed from the engines. I can relate my own experience here as I flew small airplanes for a few years. One day, taking off from Ranchero Airport in my Cessna 172, I all of a sudden saw a flock of magpies in front of me. The magpies crossed unharmed but just behind them, trying to be a member of the flock, was a parrot. Yes, a parrot. It hit the propeller and I saw feathers fly pass the windscreen. I landed an hour later and picked the badly injured but live parrot up and brought it to a friend for treatment; unfortunately it did not survive. The FAA and NTSB have been researching bird strikes for years and have developed lots of potential solutions to keep birds and airplanes separate and configure planes and engines to withstand strikes better. I hope there are better solutions than what was implemented at the Oakland Airport when five dozen pelicans, gulls, and cormorants were shot.